It's great being a Nintendo fan in Europe these days isn't it? Nowadays we normally get games at the same time as our cousins across the pond. Not so in the case of Kirby: Triple Deluxe, however — how dare NoE make us wait an extra two weeks for the loveable pink puffball? Only teasing, what's a few weeks between friends? 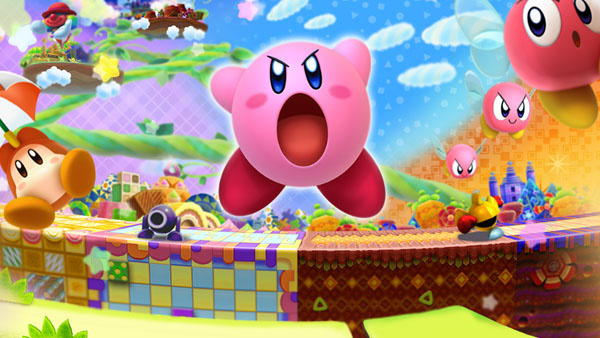 Kirby's first solo adventure on the 3DS brings attractive visuals, new power-ups, clever use of auto-stereoscopic 3D and two sub-games to enjoy. We described this as a "pleasant package" and gave it a recommendation in our Kirby: Triple Deluxe review. If you are tempted to buy this from the eShop instead of on a cart, it will cost you £34.99 or €39.99. However, those that buy on the eShop receive a free code for Kirby's Dream Land 2, so it's hard to grumble. If space on your SD card is a concern we can tell you that the Euro version of the game will take up 4820 blocks (588 MB) on your SD card. Will you be buying the latest Kirby instalment? Let us know in the comments below. Poor Europe. You guys get it for 40 Euros/Pounds, and we get it for $35. That's roughly $55. Yay Europe Region! GET THIS GAME! because I love it even after thinking I wouldn't based on the NL review. So far the platformer on 3DS that has absolutely charmed me the most. @Kiz3000 I bought my digital copy of Mario Golf World Tour through GAME's website, which did save me £5 but didn't reward me the free GBC virtual console Mario Golf download. Definitely getting this game...when it drops in price. I find it increasingly difficult to justify paying £25 to £40 for games any longer. I'm definitely going to get it, but I'll be waiting for it to hit around £15. I enjoy Kirby games but don't think I've ever really loved one. If you're even thinking about getting it, get it! Incredible game. Pre-ordered it and it came this morning! Very good game. Need to open my copy. Mario Golf has taken all my 3ds time. @Frapp Have fun waiting then. @Incarnadine £27.99 which is $47.10, but we don't pay medical insurance. @TimLatshaw Does it make you....So Happy!? Definitely the best Kirby game I've played in quite a while. You guys need to get it! The game arrived in the male today. Unfortunately, I have to play it later today because I'm doing the Pokémon X and Y International Challenge today. @Frapp I agree for 3DS games. Quite willing to pay £30 for Tropical Freeze though. Less work should equate to less cost. (Same with multiplatform). I shall. Kirby games don't tend to hold their value for long in the UK. Until then, I've got a considerable game library to entertain me, and the extra cash alllows me to pick up any bargains that I find. I got my copy on Saturday (I live in North America, but was late on this one. I got it with extra money after trading games in to Gamestop to pre-order Mario Kart 8), and I'd definitely recommend this one. It's easily one of my favorite 3DS games so far. Not that that's saying much, since I only have a few.